Not sure what size or color bump dots will work? Try this assortment of various size and color bump dots. Clear and orange, round or flat. This pack has 100 dots. Great multiple power LED pocket magnifier. 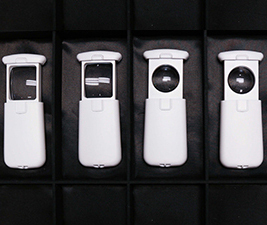 Slide out the magnifier from the protective case and it becomes a handle. LED light turns on automatically. No tricky on/off switch. Good optics, good light and lightweight. Available in 3.5x, 5x, 8x and 10x. 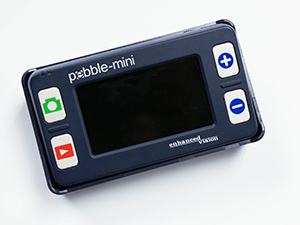 The Pebble Mini electronic magnifier has large and easy-to-use controls. The freeze frame allows you to freeze the image on the and freeze frame. Has 2 to 3 hours of battery usage. Magnification 2X to 10X. 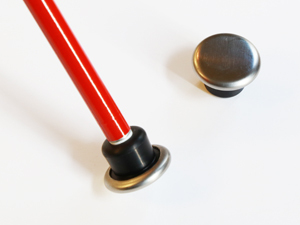 Stainless steel glide tip for use with NFB-type canes. 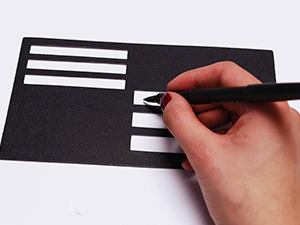 This hinged check-writing guide fits a standard size check. The hinge holds your check in place while filling out all sections. This hinged guide fits small, letter-sized stationery. It measures six by eight inches. Holds stationery in place while use and offers guides to keep writing in straight lines. 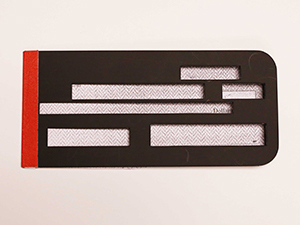 This hinged business envelope guide fits #10 envelopes and holds your envelope in place.